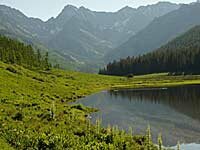 My traditional Independence Day Gore Range hike was on the Piney Lake Trail. I left home at 7:30. It takes about 40 minutes to get to Piney Lake at 9400 feet via Red Sandstone Road out of Vail, Colorado and I was walking past the Piney River Ranch and beyond the lake by 8:30. The trail goes left off of the Upper Piney River Trail just past Piney Lake. (Please click here for photos and descriptions of the Upper Piney River Trail.) Piney Lake/Soda Lakes Trail climbs moderately through aspen forest which turns to evergreen forest as is typical at about 10,500 feet. There were lots of mosquitos and I had to make a stop to spread more bug repellent. I didn’t seem to have a lot of energy and moved kind of slowly this morning. By 11:00 at 11,000 feet, I reached the top of a ridge, still in thick forest and the trail began to go back downhill. I had a map and altimeter but was having a hard time determining exactly where I was on the map. Turns out I was confused and was only about two thirds as far as I thought I was on the map but since the trail was leading downhill, decided I would go up the ridge instead, leaving the trail. The goal had been 12.390 foot Meridian Peak via the fork to Upper Cataract Lake Trail. Meridian Peak is on Elliott Ridge, the Eagle/Summit County Line. As I gained altitude and got out of the trees, it was apparent where I was by now...off the edge of my map. Thinking if I kept climbing east, I’d get to Elliott Ridge eventually, I proceeded. 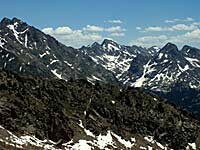 Unfortunately, as is often the case when climbing without a map, at 12:45 I reached a disappointment peak at 12,050 feet where there was a lower bowl between me and Elliott Ridge. This was a very scenic spot with a great view to the south of Mount of the Holy Cross and ski slopes of Vail and Beaver Creek. While I couldn’t see over the east side of the ridge as I had hoped when I began the day, I set up the tripod for this panorama photo and decided this would be the turnaround point. After having lunch and taking lots of pictures I started the decent at 1:30. It was an uneventful hike back to Piney Lake. I saw one group of six people and a woman by herself coming up as I went down. No wildlife. I got back to my car at 4:30.